Rosés offer the fruit and secondary characteristics of a red wine but with the refreshing, thirst-quenching quality of a white. 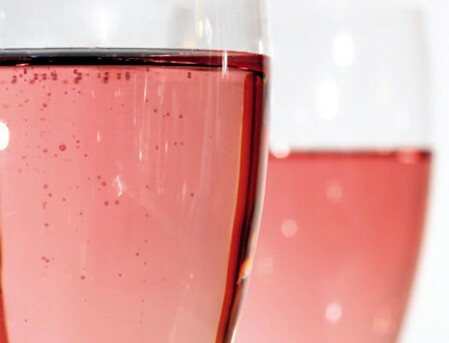 France has long produced the best rosés in the world. However, the rest of the world is quickly catching up to its reputation. South Africa, Washington, Oregon, and California are all producing beautiful, mouthwateringly fruity and lusciously dry pink wines. Most top-quality wines of this type are produced by crushing red grapes (such as Grenache, Syrah, or Pinot Noir) and leaving the skins in contact with the juice for sometimes mere hours. That brief time can faintly stain the wine a subtle tone. With longer contact, it will be darker. The Tavel appellation in southern France is famous for producing more darkly tinted rosés. Wineries in this area focus on the Grenache grape, which gives their wines a spicy fruit quality and a stony minerality. The earthy, fuller-bodied textures make them perfect companions to hearty grilled foods. Château de Mattes-Sabran, in the nearby Corbières district, produces earthy, razor-sharp rosés. Their thirst-quenching ability makes them mandatory for our sticky summers. The In Fine winery focuses on producing tasty wines with a good quality-to-price ratio. Its white, red, and rosé are blended wines sourced from the Ventoux region of southern France. In Fine's rosé is juicy and ripe with melon and strawberry aromas and flavors. It isn't a wine to contemplate; it is simply a wine to enjoy. Mulderbosch Winery is one of the most well-respected producers in South Africa. The level of quality is consistent from vintage to vintage and grape type to grape type. The rosé of Cabernet Sauvignon is like a fresh red currant, with bright, fruity hints of sweetness. However, that fruit is quickly cleaned off the palate by a lively acidity and a dry finish. In Washington state, the Barnard Griffin winery fashions a delightfully bright and zippy version using the Sangiovese grape. Tuscany's native grape behaves a bit differently here. The rosé of Sangiovese has aromas and flavors of dark raspberry and fresh cranberry with a tangy acidity and round mouth-feel. Its expression of fruit is focused and pure. Just south of Washington, in Oregon's Willamette Valley, lies Elk Cove Winery. While more known for its lusciously earthy red Pinot Noirs, Elk Cove also fashions a delectable rosé also made from Pinot Noir. Its pink wine is loaded with cherry fruit, a round luscious texture, and bright acidity. It's perfectly suited to sipping on a summertime patio. Randall Graham's Bonny Doon Vineyard on the surface looks like it's all about fun. And it is, but it's also so much more. Graham's Vin Gris de Cigare is composed of the Rhône Valley varietals Grenache, Cinsault, Roussanne, Mourvedre, Syrah, and Grenache Blanc. It's crisp, bright, juicy, and fleshy with ripe raspberry and rosewater notes. Another winery that makes perfect use of Rhône grape types is Zaca Mesa in the Santa Ynez Valley of California. Focusing mainly on Syrah and Grenache, Zaca Mesa has produced some highly rated and, more importantly, delicious red wines from both these varietals. Employing this same attention to detail, Zaca Mesa produces a faintly salmon-hued rosé with aromas of strawberry, melon, and tarragon. That strawberry carries over to the palate, along with flavors of cranberry and a zingy acidity.